The Agency for the Safety of Air Navigation in Africa and Madagascar (ASECNA) signed a contract with Thales Alenia Space, the joint company between Thales (67 percent) and Leonardo (33 percent) on February 8 in Dakar to conduct a preliminary design study (phase B) for their program to develop a Satellite-Based Augmentation System (SBAS). Starting in the 2021-22 timeframe, these services will improve the positioning performance of existing satellite navigation systems, such as GPS or Galileo. The new system will improve precision, down to within a meter, integrity, availability and continuity, guaranteed for safety-related applications. Other business sectors, including maritime, rail and road transport, as well as agriculture, could benefit from these services, which will help drive economic and social development. The phase B study should enable countries belonging to ASECNA to define the best system architecture to support the delivery of SBAS services, and to ensure transparency during the following development, deployment and operational phases. The study is being financed by a grant from the EU-Africa Infrastructure Trust Fund (EU-AITF), through a financing agreement with the French Development Agency (AFD). The European Commission and GSA (European GNSS Agency) will provide technical assistance as part of an international agreement between ASECNA and the European Union, also including the French space agency CNES (Centre National des Etudes Spatiales). Jean Loïc Galle, President and CEO of Thales Alenia Space, noted that this contract signature marks the culmination of ASECNA and Thales Alenia Space’s work on SBAS over the last few years. Following the KASS project in South Korea, this latest export success for a complex and powerful satellite navigation system is the result of the company's involvement in satellite navigation programs in Europe directly from the outset, in 1996. ASECNA will be able to draw on the firm's 20 plus years of experience to ensure passenger safety, clearly reflecting the company's watchword — Space for life. Mohamed Moussa, Director General of ASECNA, said that this contract marks a milestone in ASECNA’s SBAS program, a key catalyzer for Africa’s ‘Single Sky’ that should eventually enable the organization to improve landing safety and routing flexibility and efficiency, while making isolated regions more accessible without requiring any additional technical and human resources at airports. This also illustrates the ASECNA progress and shows the organization's ability to embrace and apply the latest innovative technologies, for the greater benefit of inclusive economic and social development in Africa. 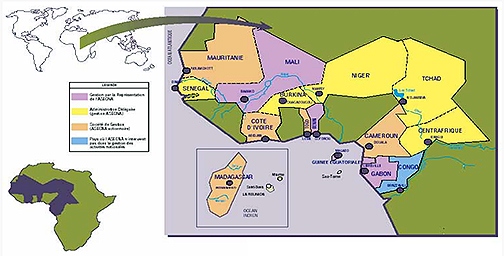 Note: The ASECNA is an international public institution whose main mission consists in ensuring safety in air navigation by covering an airspace surface area of about 16,500,000 km2 that is divided into six flight information regions (F.I.R) as defined by the International Civil Aviation Organization. In addition, ASECNA develops solutions related to airport management, studies and aeronautical infrastructure realizations, aeronautical equipment maintenance, calibration of air navigation instruments and training dedicated to the civil aviation. There are 18 Member States: Benin, Burkina Faso, Cameroon, Central African Republic, Comoros, Congo, Ivory Coast, France, Gabon, Guinea Bissau, Equatorial Guinea, Madagascar, Mali, Mauritania, Niger, Senegal, Chad and Togo.